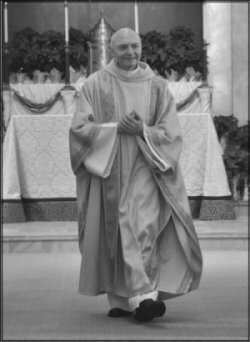 Sunday, August 15, 2010 at 4:00 P.M.
Archbishop George Niederauer announced on Saturday, June 26, 2010 that Pope Benedict XVI named Fr. James T. Tarantino a Prelate of Honor to His Holiness with the title of Monsignor. The announcement coincided with the farewell celebrations for Father Tarantino at St. Hilary Parish in Tiburon, CA. Monsignor Tarantino begins his new responsibilities as Vicar for Administration and Moderator of the Curia for the Archdiocese of San Francisco as of July 1, 2010. Monsignor Tarantino will continue in his capacity as Liaison for the San Francisco Archdiocese Catholic Charismatic Renewal. Two New Filipino Prayer Groups have formed! Saturday from 6:30 P.M. to 9:00 P.M. Check out our online SF Spirit Store. You are now able to purchase selected items from our store which is powered by Amazon.com. You will find a a variety of books, including a wonderful children's section. Various other items are also available. The sale prices for these items are not marked up. You will find the same pricing on Amazon.com's web site. We do however receive a small percentage of of the purchases from Amazon and the money from these purchases go directly back into the SF Charismatic Renewal. If you have any questions or issues with the utilizing the SF Spirit Store, please send an email to: mary@blueberrywebcreations.com.